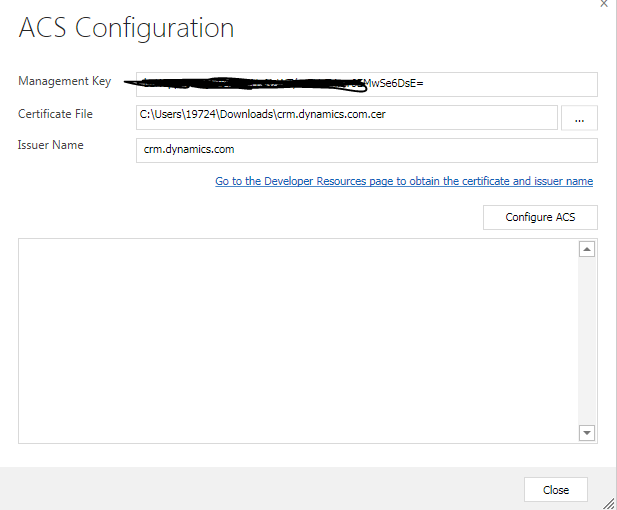 In this article we will understand how to configure a queue where Dynamics CRM can post messages and also configure Dynamics CRM as identity provider. 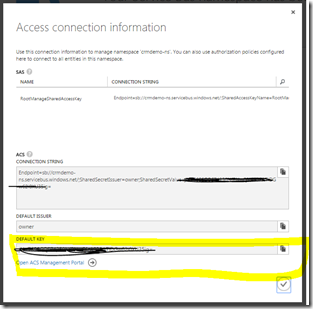 If you are familiar to Azure, normally it is just a few clicks to create a service bus namespace through the azure management portal. However with CRM, it’s a bit trick. This is because Dynamics CRM will automatically append “-sb” to the service bus namespace to identify the access control services namespace. 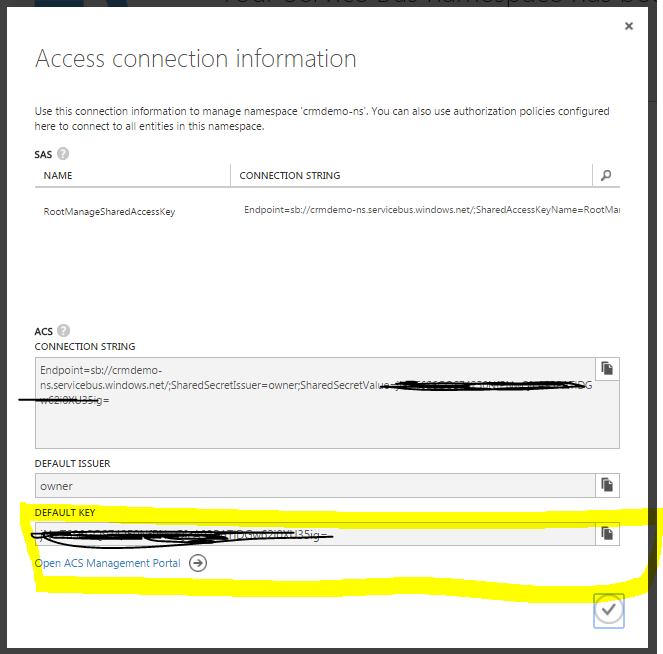 Unfortunately with the latest version of Azure, an associated access control namespace does not get automatically created when you create a service bus. Don’t worry, you can still do that with Power shell. After all limitations sometimes help us to explore new ways as well. 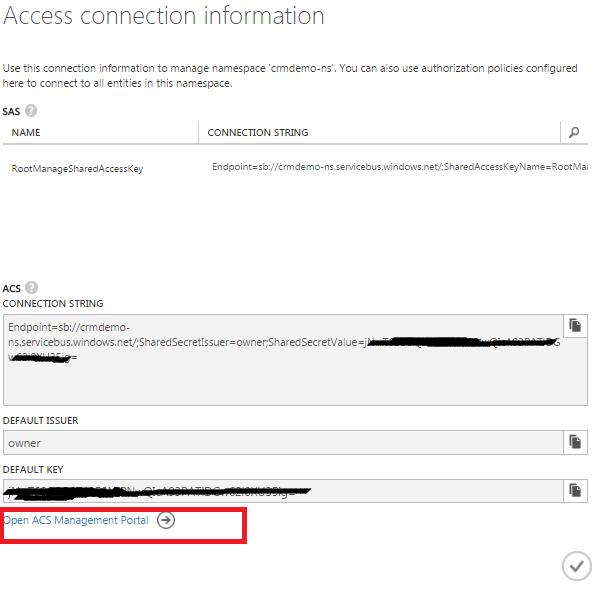 Unfortunately with the latest version of Azure, an associated access control namespace does not get automatically created when you create a service bus which used to happen previously. Don’t worry, you can still do that with Power shell. After all limitations sometimes help us to explore new ways as well. 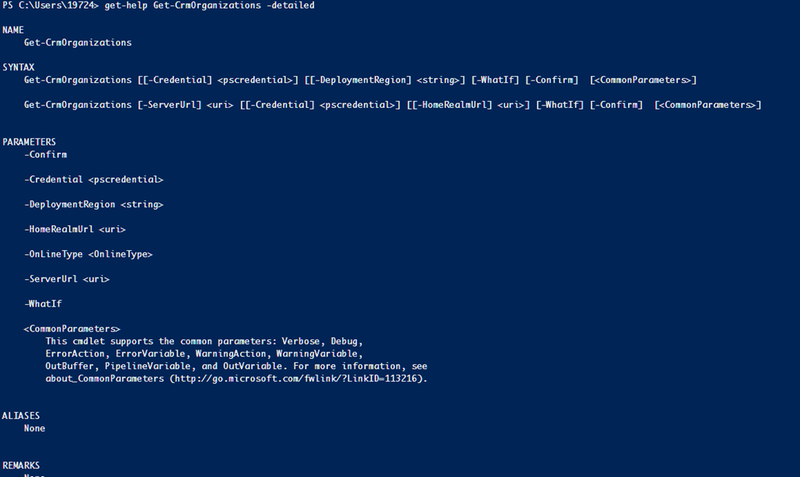 Download Azure Powershell from the below link. Remember here, –createacsnamespace is the flag which creates an associated ACS namespace along with the service bus. 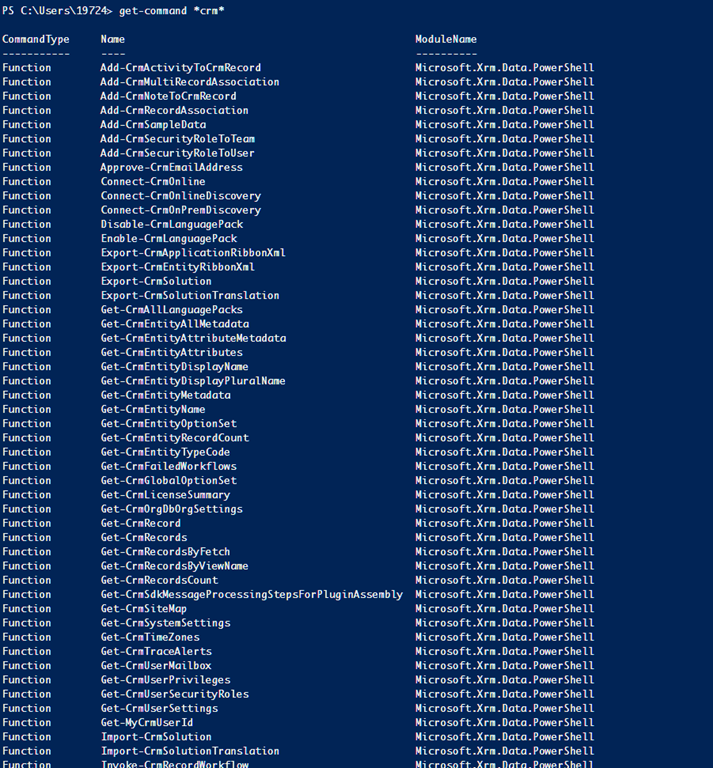 With –name we are setting up the service bus namespace. It will prompt for NamespaceType. Enter messaging in the prompt. It will take some time to get the stuffs created. Once done, you would get all your service bus details. 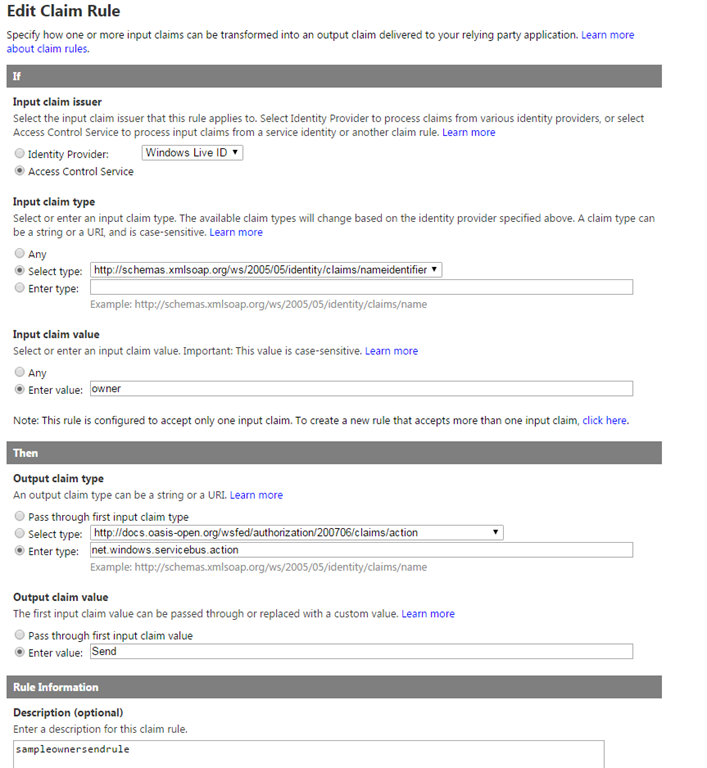 Now open Azure Service management portal. Go to Service Bus. You should be able to see the newly created service bus namespace. And you are done setting up the queue. Now in the previous post, I have explained that the whenever something needs to be posted to the queue, Dynamics CRM would be verifying the incoming credentials and provide an IP token. 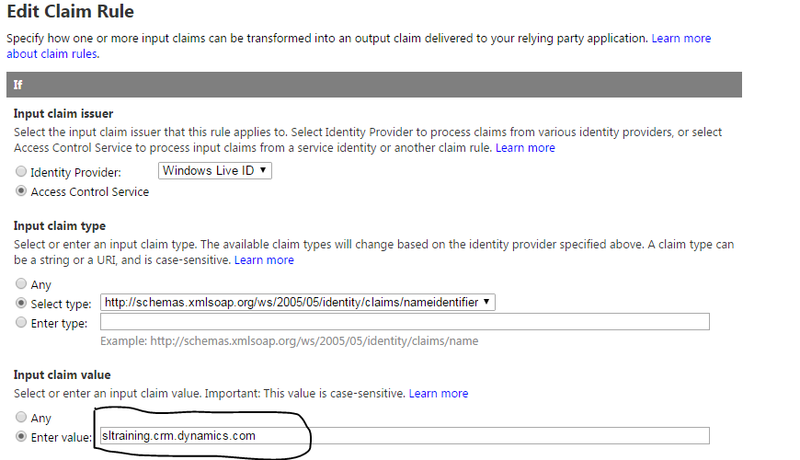 So dynamics crm is our identity provider here. So let’s set up our CRM as identity provider. Click on ‘Open ACS Management Portal’. Click on Add to add a new Service Identity. In the name field enter the issuer name. 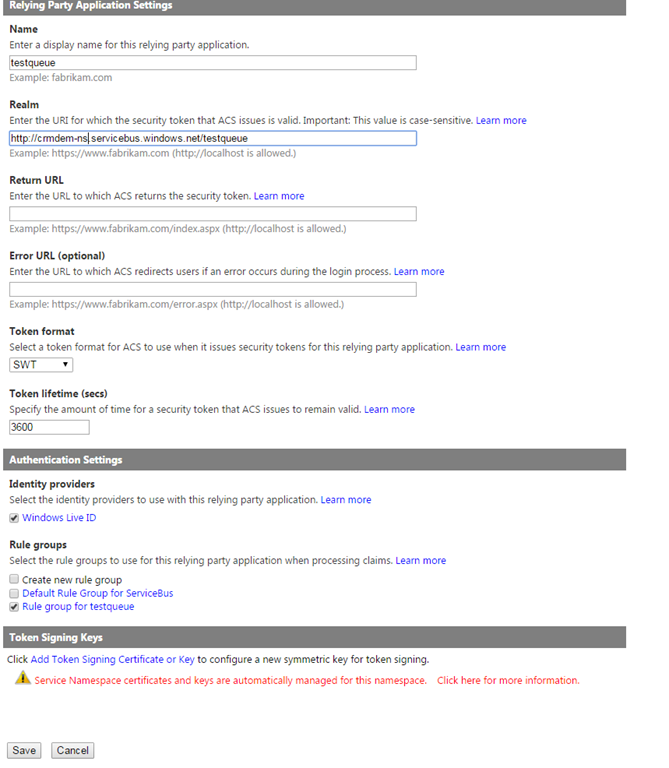 To get the issuer name go to Settings –> Customizations-> Developer resources. And copy the value from the issuer section. In the “Credential Settings” section select X.509 certificate and then upload the downloaded certificate file. Click on save and you are done. 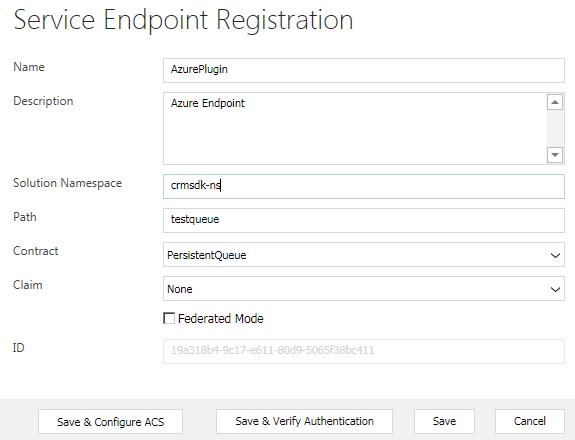 So we have successfully set-up the queue and also Dynamics CRM as identity provider. You might be thinking, we already have so many wonderful blog articles which explains how to do this. I agree. But in most of the cases, not the whole steps from the start to finish is mentioned to make it work in real life. In some cases, it is neatly depicted what you should do but why are you doing the same is missing. After all knowing the why part of it with the how part is something we always desire and helps us to design better solutions going forward. So if you have not tried this, I hope that after reading this post you would understand things better than before. On the other hand if you have configured and the integration works for you as well but you are not sure about how it works, I would suggest you read this. 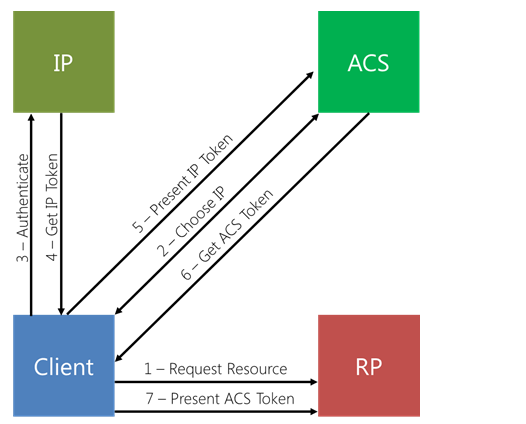 If you have very good idea of what Azure Service bus is and how does ACS authenticates with service identity, unfortunately there is nothing new for you guys here. So let’s start. Let us split out the components and understand what role they play in this integration. First is Azure Service Bus. For a quick understanding just think of it is a broker which passes messages between two components. You can compare this to postal services. You want to send a message to someone residing in some other part. You use the postal services. It takes the message from you and delivers it to the appropriate receiver. How does the postal service identify the receiver? Well you have mentioned the address right in the message envelope. 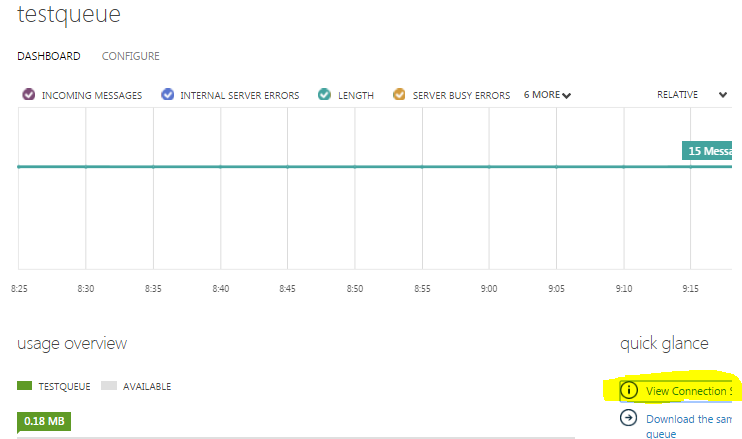 Comparing to the above, Dynamics CRM is the sender and a Queue configured in Azure service bus is the receiver. 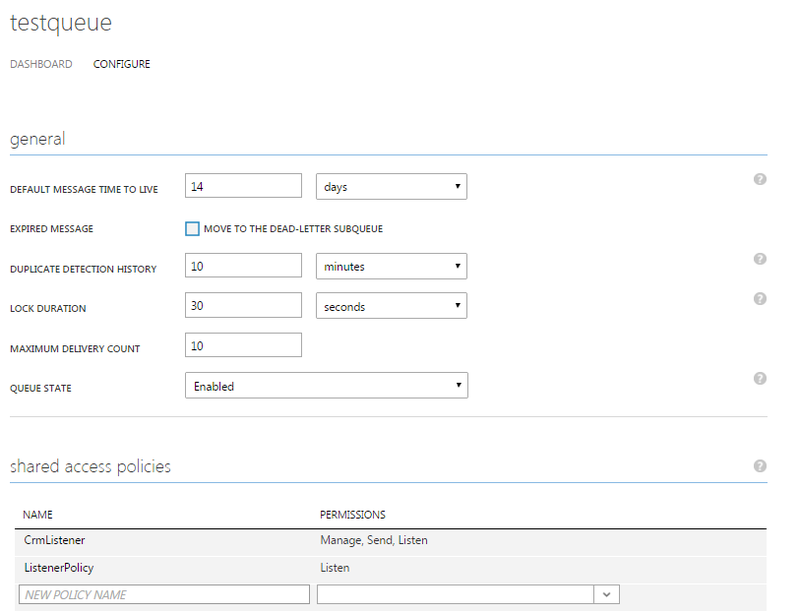 All you need to do is configure your service bus to collect the message from CRM and deliver it to the queue. And like the postal service, you would indeed need to provide the address of the queue to the service for it to deliver the message correctly. So the whole thing works like this. 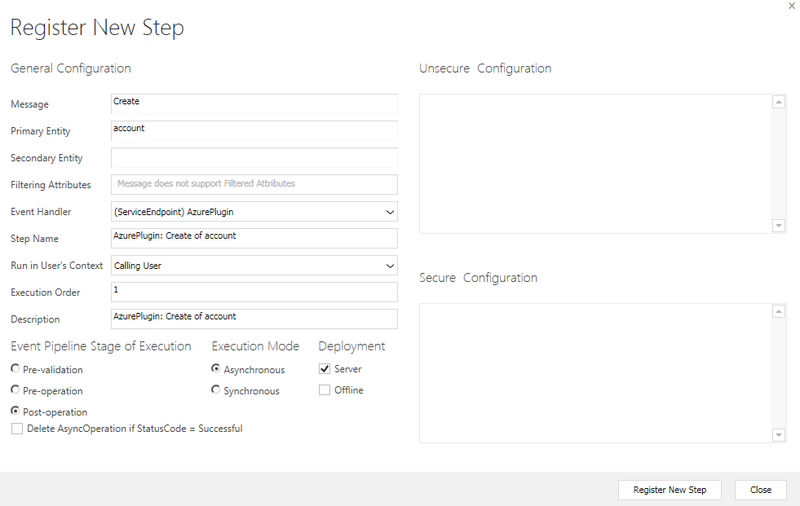 A user of Dynamics CRM will post information to the Queue hosted in azure service bus. The service bus would need to authenticate CRM User against the queue. 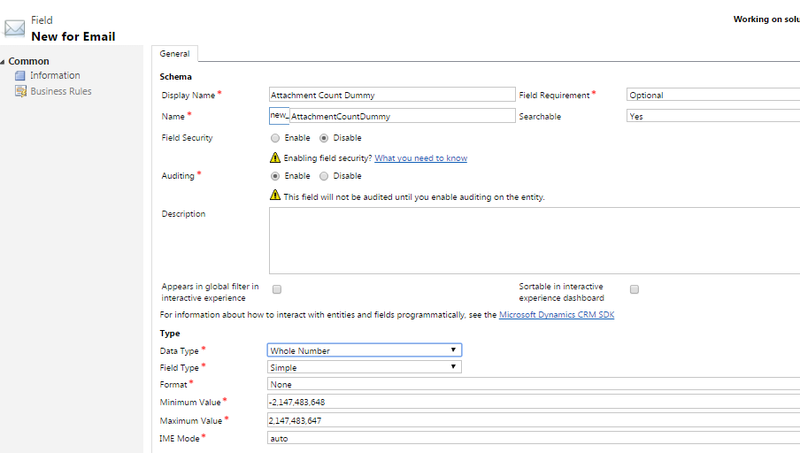 Any Dynamics CRM user who posts information to the queue and those claims should be understood by the Queue. Now since these are two separate applications, the claims generated from one might not be understood by the other as they might not speak the same language. So now what. 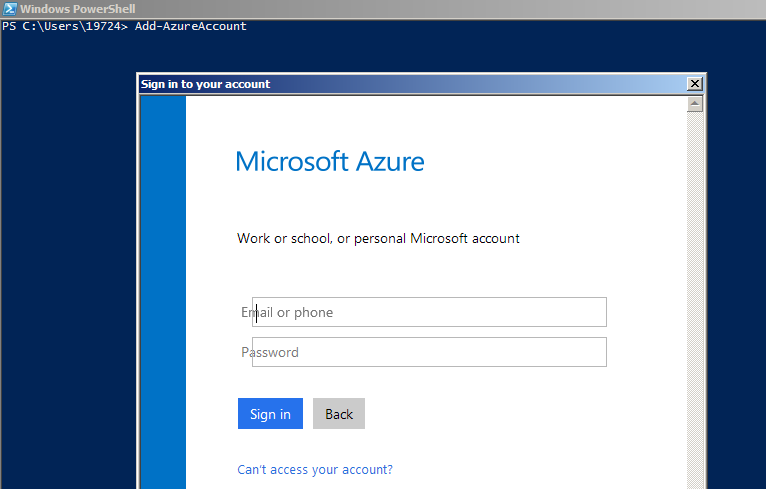 Here in comes the concept of Access Control Sevice in Azure Bus Services. The queue will be set-up to trust the Access Control service and any claims generated from the ACS would be accepted by the queue as a valid token and it would allow those messages to be sent to the queue. The mechanism is very well explained in the below screenshot. IP – Identity Provider. 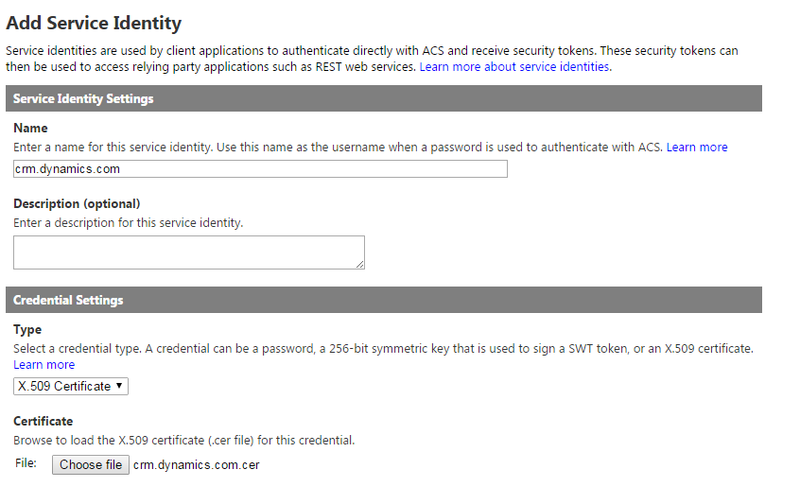 Here Dynamics CRM is identity provider. RP – Relying party which trusts the ACS. For our example it is the Queue. Client – The user of Dynamics CRM who is trying to post message to the queue. The mechanism is explained in the following steps. A user in Dynamics CRM tries to send a message to the queue. 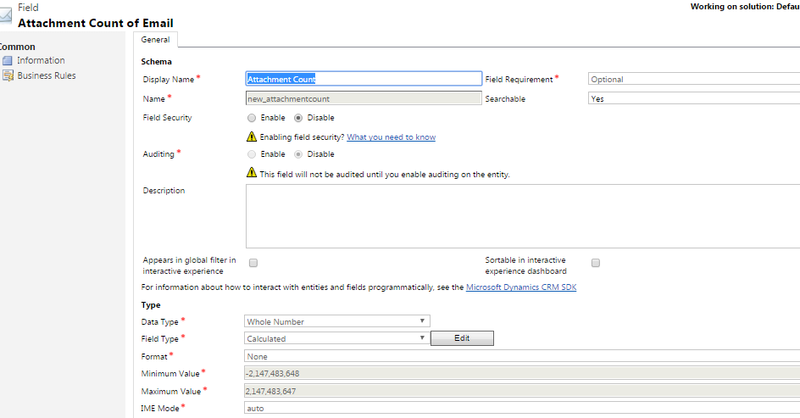 Dynamics CRM verifies that the request is generated from a valid user and generates a IP token (identity provider token). 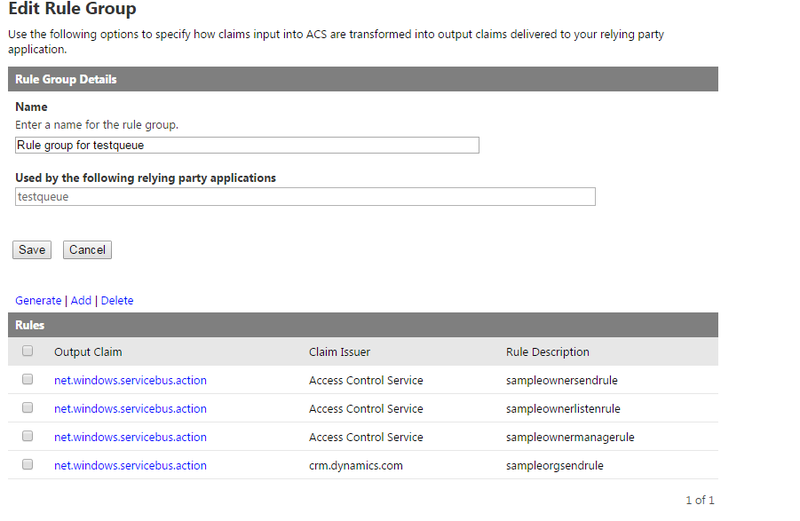 ACS does the hard job of converting claims from IP token to appropriate claims understood by the Queue and sends an ACS token to the user. Now since the Queue trusts token generated from ACS, it will allow the message into the queue. Hope now things are getting cleared up. And since we now understand the basics, once we do the steps, we know why are we doing this apart from how to do it. So let us check all the steps we need to do for this. I have broken this down in a series of blog post otherwise a single post would be pretty lengthy. Recently we had a requirement from our customer to show the number of attachments for each email in a view. The number needs to be reflected whenever the user refreshes the view. Simple requirement right? And what is coming to your mind? Plugins? Workflows? Well if you are thinking of the Plugins and workflows, I am sure you are not alone. In fact the first thing that came to my mind was the same. But we are in CRM 2016 right? And is there no other way to achieve this? I brainstormed for sometime and then came up with the below solution. Believe me it is a simple solution without any code and I am pretty sure you would like it. No it is not rollup field. 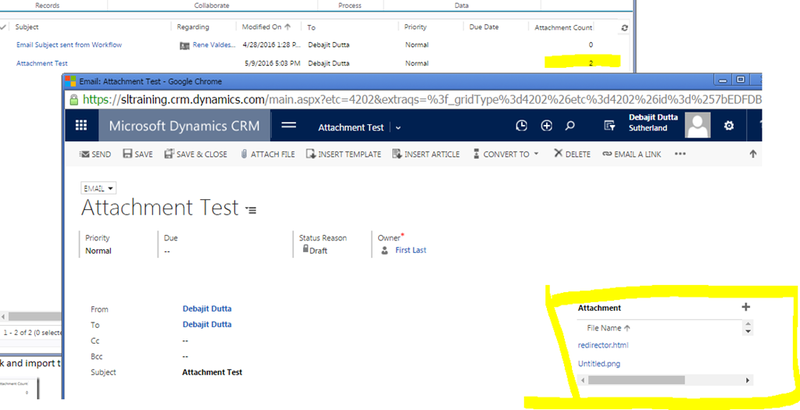 It is using the calculated field feature of Dynamics CRM. 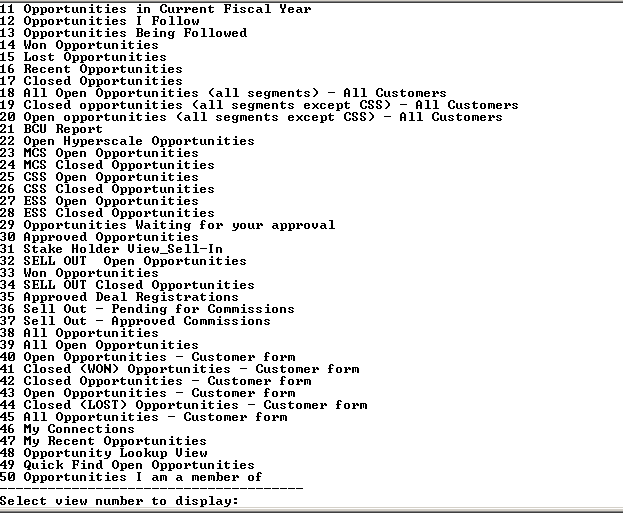 Let us first look at the email entity in CRM. 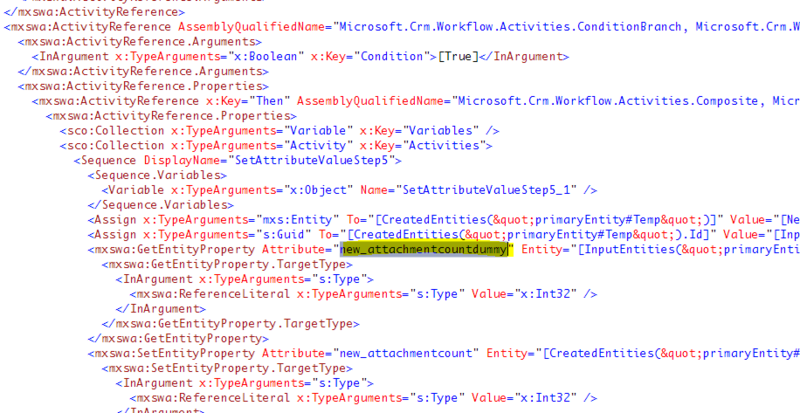 A quick glance at the email entity and you could see there is field already in the email entity called ‘Attachment Count’. Wow! Can’t we use this field. Unfortunately the answer is ‘No’. If you open this field, it is a non-editable field and it won’t appear in your view and advanced find as well. Nor you can use it in roll-up fields or calculated fields editor. Sad isn’t it. To start with I created a solution with the email entity in it. And then I created a dummy field called ‘Attachment Count Dummy’. Don’t worry I am just creating a dummy field here. I will delete it later when done. As of now just make sure you make the field as ‘whole number’ type. Great. So we are done with our first step. Now we create our real field to store the attachments. I name it the same ‘Attachment Count’ of type whole number. But this I make it a calculated field. I set it to be equal to ‘Attachment count dummy’ field. You may be asking why not set this field to the OOB attachmentcount field. Because as I mentioned before, the OOB attachmentcount field cannot be used in calculated field editor. Save and close the editor. Include this calculated field in whichever views you want. All set and done. Now comes the real trick. Publish everything and export the solution. Once the solution is exported, unzip it and you would see the contents. It should have a Formulas folder where CRM stores all the calculated field formulas. Open the folder and then open the formula of the ‘Attachment Count’ calculated field .xaml file in a xml editor of your choice. Replace the dummy field name with the name ‘attachmentcount’. Note this is the most important step. I open my email, attach one more attachment and as soon as I refresh the view, I could see the count being incremented. Are we missing something here? Yes. You remember we created an extra dummy field. Go ahead and delete it. It won’t do any harm if you delete it. But you would be left with an unnecessary field. Wonderful isn’t it? I hope you liked the idea.